This is one of the windows of the apse. The apse, that is, the semi-circular area of the sanctuary which contains the altar, has been a usual feature of Christian churches since the first century. The first churches were usually converted Roman basilicas, buildings which were used for assembly halls or law courts. The place where the judge originally sat became the spot from which the priest came to preside over the Mass. In time the altar was moved from its central, free standing position and it was place against the back wall of the apse where it remained until the Second Vatican Council restored it to its original position. The apse of St. Andrew's is lit by nine small Gothic windows. 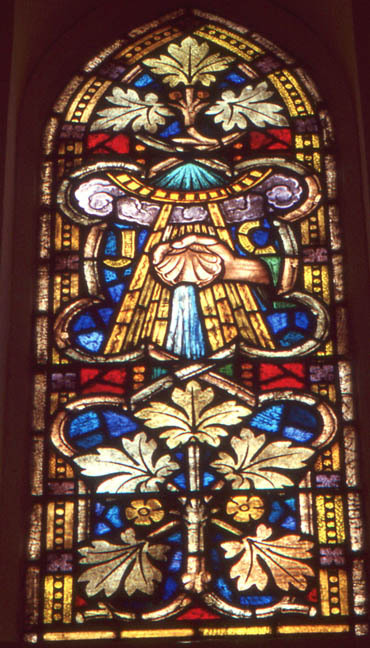 Seven of them portray the seven sacraments; the first and last windows bear the "alpha" and the "omega", the first and last letters of the Greek alphabet. One of Seven Sacraments: Baptism. Christ comissioned the apostles to "Go, therefore...baptize them in the name of the Father and of the Son and of the Holy Spirit (Matthew 28:19). He himself submitted to a rite of baptism by water in the Jordan River. (Matthew 3:13, etc.) 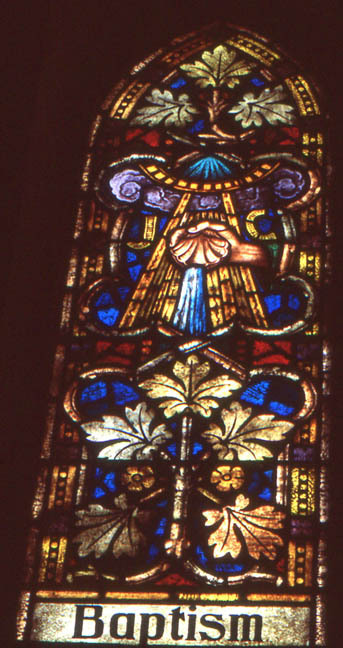 Amidst the ornate foliage which decorates the window, a hand pours down the waters of Baptism; so water has been the universal symbol of the sacrament of Baptism. Christ implied that he was the Living Water when he spoke in the Temple early in his ministry (John 7:38).